The Delray Beach City Commission will discuss on Tuesday whether to accept a $2 million state grant to install a bike path along Swinton Avenue that some residents bitterly oppose. The opponents say that project will ruin the ambiance of the city’s historic district and make the road more dangerous to travel. They are particularly upset about removing more than 100 trees along Swinton. The state awarded the city the money five years ago. The project was proposed by an organization known as Human Powered Delray. It calls for paving and putting in bike lanes on Swinton from NE 4th Street down to SE 10th Street. Fast-forward to the present when funds now came available and the trouble begins. Apparently the City Commission at the time authorized the state to design the project. But the design did not take into consideration Delray Beach’s historic district. It’s one thing to pave a road and quite another to widen it for bike lanes where the homes are already close to the road and residents have to be extremely careful when backing their vehicles out onto Swinton. But the removal of the trees has provoked the most vocal protests. Opponents say that eliminating a canopy of mature trees that provide shade and character to a historic enclave is a terrible idea. 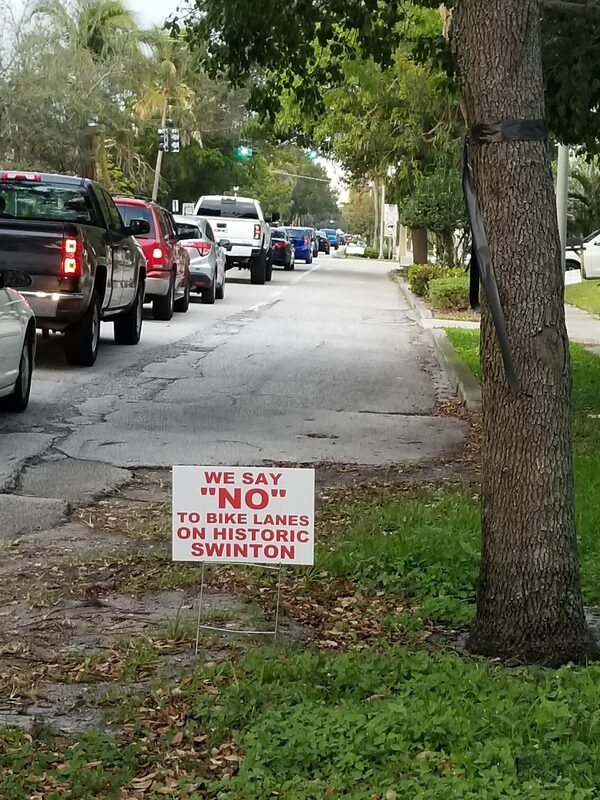 Opponents have tied ribbons onto the trees while signs declaring “Save the Trees on Swinton” have sprouted up all around the city. Opponents also contend that the project will affect water drainage in a city that is battling chronic flooding from sea-level rise. Second Avenue, which is close to Swinton, has beautiful bike lanes already. The city’s main shopping and entertainment thoroughfare, Atlantic Avenue, is often teeming with pedestrians. The City Commission will be holding a workshop on Tuesday, (Jan. 22) at 4 p.m. to discuss whether to accept the grant or find a compromise. The city’s commissioners will have to determine if a project that would make the city more accommodating for pedestrians and cyclists is worth changing the character of its historic district. Perhaps the answer is to ask the state to reconsider the design of the project or permit the city to pick up the design work to foster a situation where conservation and innovation can coexist. Benita Goldstein is a civic activist in Delray Beach.